The national flag of Switzerland is composed of a red background with a white cross in the center. National flag of Switzerland is square Flag. There are only two square flags in the world. It is based on the Canton of Schwyz flag. It is a symbol that identifies Switzerland internationally. 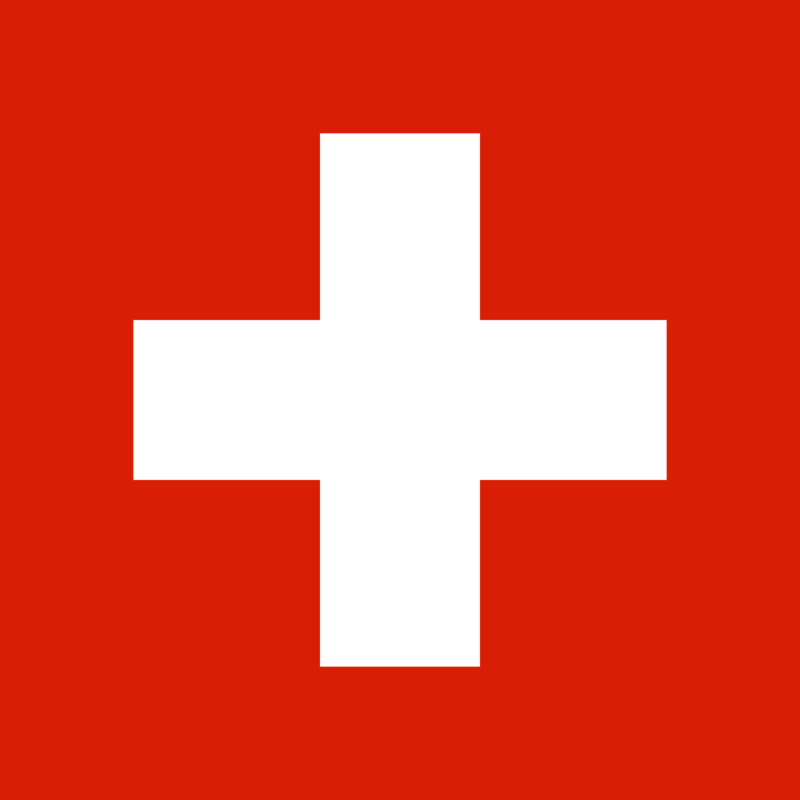 The flag of Switzerland is composed of a red background with a white cross in the center. It is one of only two square flags, the other being that of the Vatican. It is based on the Canton of Schwyz flag, dating from 1474. The flag of the Swiss Confederation was probably inspired by the insignia of the Canton of Schwyz, which received a silver cross in commemoration of its struggle with the troops of the Holy Roman Germanic Empire. The former Confederates already used the Swiss cross as a badge on the battlefields. The earliest date dates back to the Battle of Laupen in 1339. At first, the arms of the cross were narrow and long, reaching the edge of the cloth, as in the Scandinavian countries. Country without exit to the sea located in Central Europe and that counts on a population of 7,725,200 inhabitants (2009). Switzerland is a federal republic of 26 states, called cantons. Bern is the seat of the federal authorities, while the country’s financial centers are located in the cities of Zurich, Basel, Geneva and Lugano. Switzerland is one of the richest countries in the world according to its GDP per capita (seventh place worldwide), which amounts to US $ 67,384. 50% of its Gross Domestic Product (GDP) comes from financial businesses, in fact in Switzerland it covers a third of the wealth in private hands around the world. Prior to the 19th century, there is no national flag of Switzerland. On the battlefield, the Swiss waved the flag of their native canton. However, since the Battle of Laupen in 1339, the combatants wore a white cross on their dresses as a sign of identity. During the period of the Helvetic Republic (1798-1803), Napoleon forbade the Swiss to carry a cross and forced them to fly a tricolor flag (green, red and yellow). When the Helvetic Republic dissolved in 1803, the Swiss returned to their white cross which they used to place on top of their cantonal flags. In 1815, after the fall of Napoleon, the Swiss troops wore a red armband with a truncated white cross. In the following years the use of an unofficial federal flag was gradually introduced. This flag was used only once in a war, in the civil war or war of the separatist league (Sonderbund) of 1847. The war was unleashed between the defenders of the traditional values ​​and the communal autonomy, on the one hand, and the Modernists and defenders of the centralization of the State, on the other. With the victory of the liberal party, the Swiss flag became an unofficial national symbol.